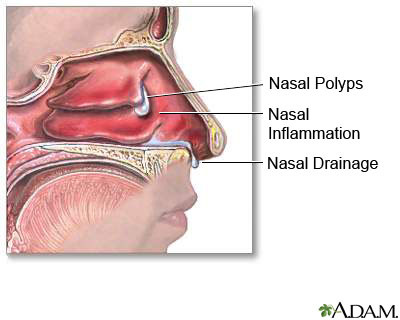 Nasal polyps are soft, non-cancerous growths that develop on the lining of the nose or sinuses. They are the end product of chronic inflammation that may result from a viral or bacterial infection, allergies, or an immune system response to fungus. Chronic inflammation causes the blood vessels in the lining of the nose and sinuses to become more permeable, allowing water to accumulate in the cells. Over time, as gravity pulls on these waterlogged tissues, they develop into polyps. Polyps are generally soft and pearl colored, with a consistency like jelly. Polyps may be single or several, clustered together like grapes on a stem. Inhaled Nasal Steroids. Inhaled nasal steroids reduce inflammation and help shrink polyps. This is the preferred treatment for most small polyps. Oral Corticosteroids. Oral corticosteroids are faster and more effective in reducing the inflammation and polyps. Unfortunately, the effects are usually temporary. Since oral steroids can cause serious side effects, the treatment course is usually brief. Medications to Control Allergies or Infections. In addition to treating polyps, other medications may be necessary to control the underlying cause of the polyps. For example, for polyps caused by allergies, allergy medications in patients with hay fever or other allergies may help relieve the allergy symptoms and slow the growth of the polyps, although they won’t necessarily eliminate polyps. In addition, antibiotics may be required to treat a sinus infection. If the infection is the underlying cause of the polyps, often times by treating the infection, the polyps resolve. Antifungal Medications. On occasion, chronic sinusitis and polyps may be caused by an unusual immune system response to environmental fungus. In these situations, antifungal medications may be useful. In addition, surgical removal of fungal debris also may be necessary. Allergy Shots (Immunotherapy). If allergies are contributing to polyp formation, desensitization to the allergens may help alleviate the condition. The goal of allergy shots is to “train” the immune system over time to be better able to tolerate the allergens that trigger the polyps. Allergy testing is used to help identify the specific allergens that are causing the reactions. Allergy shots contain small amounts of these allergens and are given on a regular schedule so that the body gets used to the allergens and no longer overreacts to them. Surgery. If medical treatments are not effective, surgical removal of the nasal polyps may be of benefit. Surgical approaches are safe and effective, however, if the underlying cause of the polyps is not also addressed, the polyps are likely to recur.